Double or single molded-case transfer breakers per section can have load bussing connecting to adjacent distribution sections or lug terminations for remote loads. Full manual bypass and automatic controls are standard as well as long life LED-lamped pilot lights. 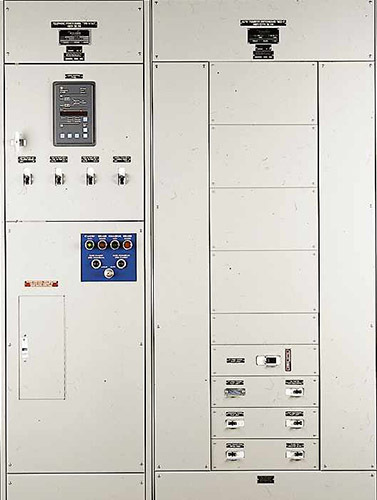 The automatic transfer logic panels are shown with pilot lights to indicate voltage presence on each source, as well as testing controls for system exercising. The transfer breakers are equipped with fully automated controls, having neutral position time delays to protect electronic and motor loads from power surges. Plug-in relays are used in the transfer controls, that each have integral pilot lights that illuminate when the relay is energized to aid in maintenance. A microprocessor-based Automatic Transfer Logic panel can be integrated into the transfer switchboard or wall mounted. Our transfer logic panel employs a master-slave design whereby it can operate any number of transfer switches from one master control. This control can be integrated into a priority load acquisition, load shed, system when used with paralleled standby generators and energy management systems. Loads from all switchgear manufactured by W.A. Benjamin Electric Company can include connections to bus duct.